I had a very eventful week, and because I was feeling pretty happy, I hauled some stuff over the weekend and you would have saw it on my instagram. One of my very happy buys is the YSL Rouge Volupte in 15 Extreme Coral. I was swatching at the store, while deciding between their Rouge Volupte line and their Rouge Volupte Shine line. The latter made my dry lips look really sad, so I decided on this. 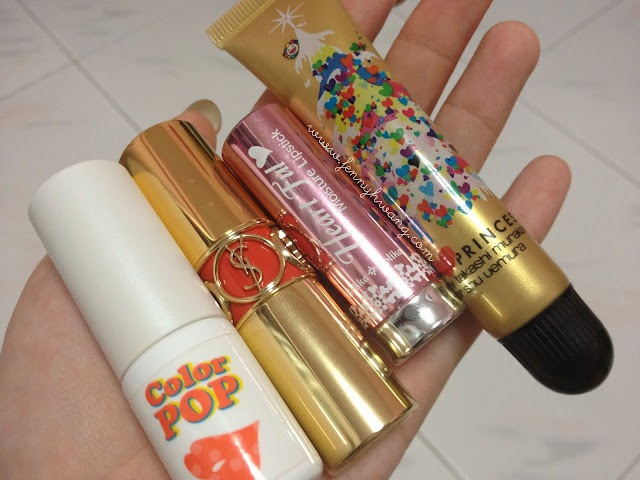 Its a really creamy, pigmented and long-lasting lipstick. Even after half a day, it barely fades and if it does, it leaves a stain (love!). When I got home and happily showed it to my bro, him being the wet blanket as usual, said: I think you have similar colours right? I was like NOOOO but then I did a swatchfest and I found not one but three possible dupes for this. I still reallllyyyy love the lipstick, don't get me wrong! I just thought that wow, I really love this sort of color huh. The Etude House Color Pop series was my favourite ever collection from them because there are many orange-coral shades! I was sent this lip tint in a pink box last year, and I think this might be a possible dupe for YSL's Glossy Stains. Its very similar to this color but the texture, lasting power and finish is veryyyy similar to the glossy stains. I don't find that they last very long on my lips. This color is #2. The second product is probably the closest dupe I have in my stash - its the Holika Holika Heartful Moisture Lipstick in OR210. It has a very similar colour, texture, feeling except the stick is in a heart shape hehe. I would say that YSL's is a tad creamier, but everything else is really similar, but not the same. This product is really cheap, like not exceeding $20SGD I believe. 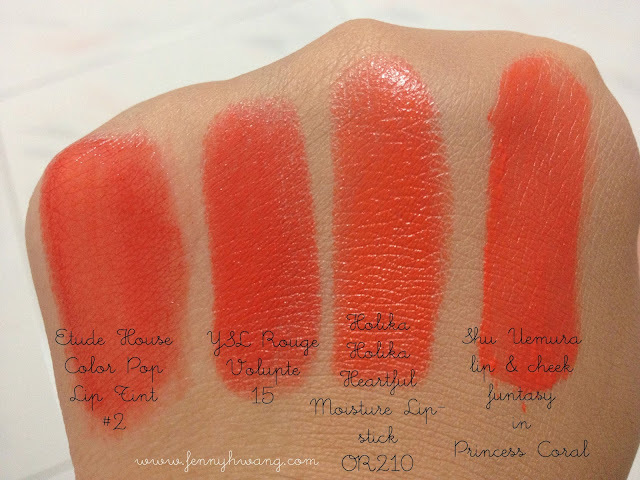 And the last product was part of my Christmas wishlist - Shu Uemura's 6 Heart Princess lip & cheek fun-tasy in Princess Coral. The color is very alike, but the texture is drier and more matte (it is meant to be like that). It also doesn't outlast YSL's, but it does win the Etude House tint. Pricing wise, this gives you a bang for your buck because the tube is rather big, at 15g for just $33. But its limited edition so I'm not sure if you can still get it now.